Summary of Pope St Sixtus & Companions, Martyrs. They died on 6 August 258, martyred the year after his election as bishop of Rome during the persecution of the emperor Valerian. According to his contemporary, Saint Cyprian, he was “not so much killed as crowned, ” along with four deacons, while addressing a congregation. Honoured as one of the most popular Roman martyrs, and mentioned in Eucharistic Prayer I (The Roman Canon). 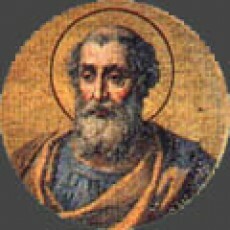 During the pontificate of Sixtus’s predecessor, Pope St Stephen I (253-257), a sharp dispute had arisen among the Christian churches about the attitude to be taken to those who had lapsed from the faith during persecution (should they be kept out or re-admitted?) and the attitude to be taken towards those who had been baptised by heretics (was that baptism valid or should they be re-baptised?). St Cyprian in Africa and the churches in Asia favoured a stricter approach while Rome in the person of Popes St Stephen I and Pope St Sixtus II favoured a more conciliatory approach which eventually won the day. 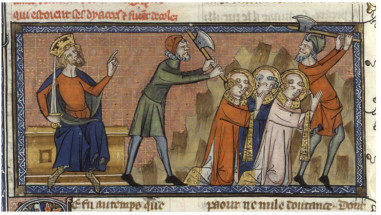 When the Emperor ordered the persecution of Christians, Sixtus was with four deacons at the cemetery of Saint Callistus when the soldiers came to take him to his execution. He was buried at the catacombs of Saint Callistus. At the time when the sword pierced the bowels of the Mother, I, buried here, taught as Pastor the Word of God; when suddenly the soldiers rushed in and dragged me from the chair. The faithful offered their necks to the sword, but as soon as the Pastor saw the ones who wished to rob him of the palm (of martyrdom) he was the first to offer himself and his own head, not tolerating that the (pagan) frenzy should harm the others. Christ, who gives recompense, made manifest the Pastor’s merit, preserving unharmed the flock (PL 13:383-4). Every Pope up to and including Sixtus II was a martyr.